Casa Biondi is a masterpiece of design and renovation, once a waning farm house now a classically furnished private home amidst one of the most beautiful wine producing estates in the Val d'Orcia, a World Heritage Site of hilltop towns, acres of some of the most renown vineyards in the world, ranging, mountainous beauty and big bold skies. The countryside is a photographer's dream and the towns are a treasure trove of Renaissance and Medieval art and architecture. Standing boldly on the hilltop across from the Castiglion del Bosco estate is Montalcino a legendary area for wine - notably the full bodied Brunello di Montalcino - and honey. At 693 m2/ 7461 sq. feet Casa Biondi has no lack of space. Outside are landscaped gardens and lawns, a heated outdoor pool in natural stone, a pergola-covered BBQ terrace and spectacular views of the surrounding countryside. Inside are designer fabrics, wood and terracotta floors, fabulous high ceilings and wonderful features such as decadent walk-in wardrobes and ranging, spacious, well-appointed rooms with antique and handmade furniture. The ground floor is elegant, spacious and homely too. The living room has a wonderful authentic Tuscan fireplace. There is a library area, which is perfect for disappearing into for a quiet break from the sunshine or a game of chess. The dining area is beautifully presented and leads into a designer kitchen that might just inspire your culinary skills to come out, or those of your cook! There are also 2 beautiful bed rooms on the ground floor. Upstairs there are three fabulous bedrooms with en suite bathrooms and one of which has a walk in wardrobe. Across from the villa just 2.5km away is the Borgo of Castiglion del Bosco with two fabulous restaurants, a state of the art spa complex, tennis court and golf course, a famous frescoed chapel and an infinity swimming pool that overlooks Montalcino and the spectacular Val d'Orcia. 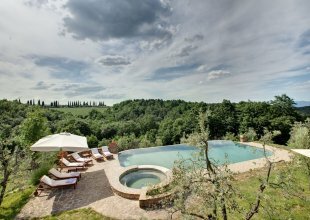 The views are spectacular, overlooking the estate and the Val d'Orcia. The property gets fantastic sunsets. As a protected nature preserve within the Val d'Orcia Parco Naturale, Castiglion del Bosco boasts spectacular natural beauty. 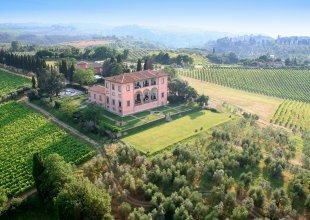 Nearly three-quarters of the Estate is blanketed in forest - home to cinghiale, deer, fox, porcupines, badgers, hawks and pheasants. Each season a diverse selection of flora add visual drama and fragrance - Italian Stone Pine, Chestnut, ancient oak, olive trees, stately Italian cypress and smaller species like bay laurel, thyme, rosemary, brilliant red poppies and acres of terraced grapevines. N.B. Pool is open and unfenced.